A LWB X5 for China makes sense. 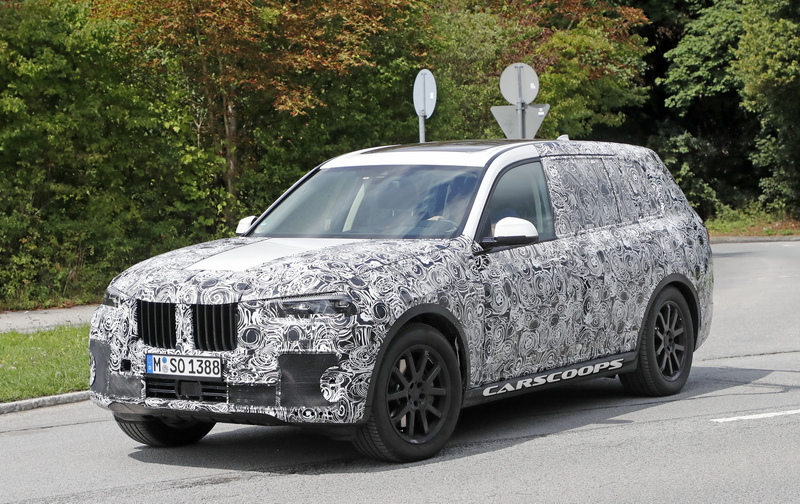 This looks too much like a stretched X5 with full camo but then if BMW was testing a X7, it would be a mule now, and the most logical way to hide it would be a stretched X5, perhaps in camo to disguise the length. Could make sense, personally I do not recall the last time a BMW mule was posted on the forum for a brand new model, maybe it was the 1 series MPV? seems like the grill will be more imposing than other BMW's. I can't imagine anything to be shockingly boring from BMW anymore. it would only shock me if it wasn't boring at this point. it would only shock me if it wasn't boring at this point. It will look like what it is...a bloated X5. Indeed it does. like a longer "soccer mum" version. But definitely not like a luxury vehicle. Looks boxy but clean. Can't say I'm disliking it so far. BMW dealers are no doubt itching to get this because it has great potential to grab buyers now heading to Mercedes for the GLS or to Cadillac for an Escalade to address their large SUV needs.